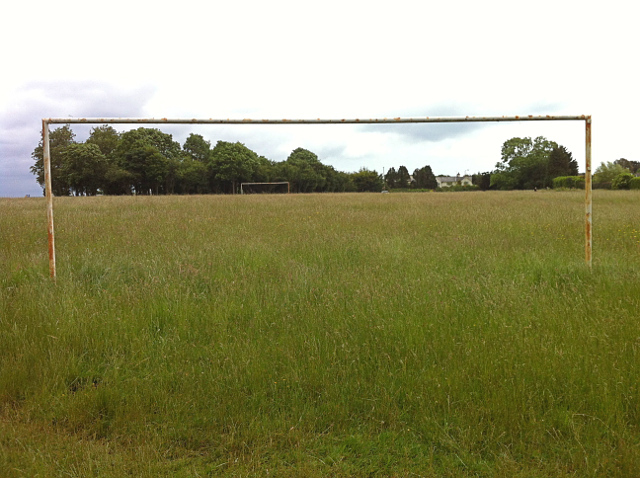 Goalposts on the common. The pitch shows not the slightest signs of use, nor is the common mown to encourage it. Galmpton Warborough common, a 10 ha common around the village of Galmpton and straddling the Dartmouth Road. Owned by Torbay Council, and with registered rights to graze cattle and sheep, though these are no longer exercised. Subject to a scheme of regulation and management under Part I of the Commons Act 1899 made by the former Totnes Rural District Council in 1930. The council was sued in 1978 by local residents over its management of the common, and particularly its permitting widespread use of the common for car parking: the resulting High Court order is still relevant today. © Copyright Hugh Craddock and licensed for reuse under this Creative Commons Licence.